I finally arrived at my mom’s and will help celebrate her birthday a day late. Better late than never! Here is a recap of the marathon… I will write some more later about the interesting time we had outside of the actual race, but I want to write about the race alone in this post. We started at exactly 7:00. I was so nervous at the start, but after we got 1/4 of a mile into the marathon, nerves turned into running. It was really crowded for the first 4 miles or so and then it spread into a manageable amount of runners. For me, I started at an 8:00 pace. Fast for me, but I had my reasons. I really wanted a chance at my dream of running it under a 3:30 and I figured if I didn’t try, I wouldn’t know if it was possible. I ran an 8:00 pace for 12 miles. Not bad. But that was about all I could do. Almost out of nowhere I lost the steam to keep the pace. 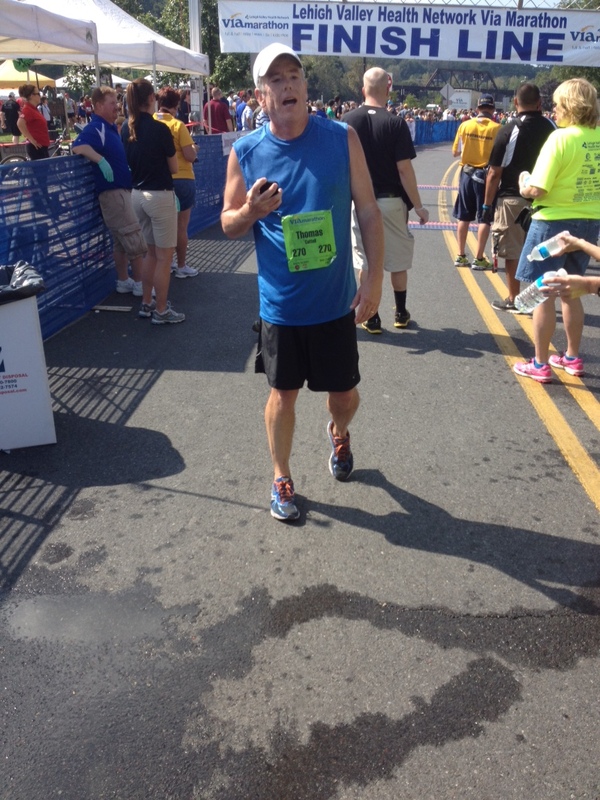 So, knowing I wouldn’t make my first goal, I settled in to finishing the race and enjoying the run! It was an interesting course. Fairly hilly in the beginning. Then we got to the river and the trail beside the river. For about 8 miles we ran this trail. Two grooves of dirt with grass in the middle and on either side. So runners settled into a groove and did the best they could to pass when possible. I fell in behind a guy who was keeping an 8:00 pace. For several miles I just ran his pace. That was nice, until he suddenly stopped to walk. Ugh. That messed with me a bit. But I kept going and finally got through that 8 mile stretch. At the half way point when my steam ran out I ate gels and drank Gatorade to keep me going. That was a good plan. I ran for a couple of miles and walked through the water/Gatorade stations. As soon as I downed my sugar, I was running again. At mile 15 a woman handing out Gatorade asked me if I was okay. I said yes, but I guess I didn’t look that great. After that, I turned off my app and just ran as I could run. Not very fast, but not walking either. In my mind I kept thinking, “If I walk, I won’t finish as fast”. At mile 20 I fully hit the wall. We had just run 16 miles of river trails and gone up a hill and now were running on gravel. I had to walk a bit. I then got a text from my Lovely Wife saying to keep going and she was pulling for me. I thought, I can do this. Not long after, I started running again. I never walked longer than a minute or two. I just kept putting one foot in front of the other. Finally around mile 22 we got back onto asphalt. I never thought I’d be so happy to see a road again. This was the hardest part. Between mile 22 and 24. I hurt a lot. I would run a while and then have to walk because my whole body hurt. After a minute I’d start running again. Then I made it to mile 24. Another runner, about age 35 came up beside me and we began to talk. He told me he had run 3 other marathons but not run one in a couple of years. We talked for almost 2 miles. Wow, that really helped. 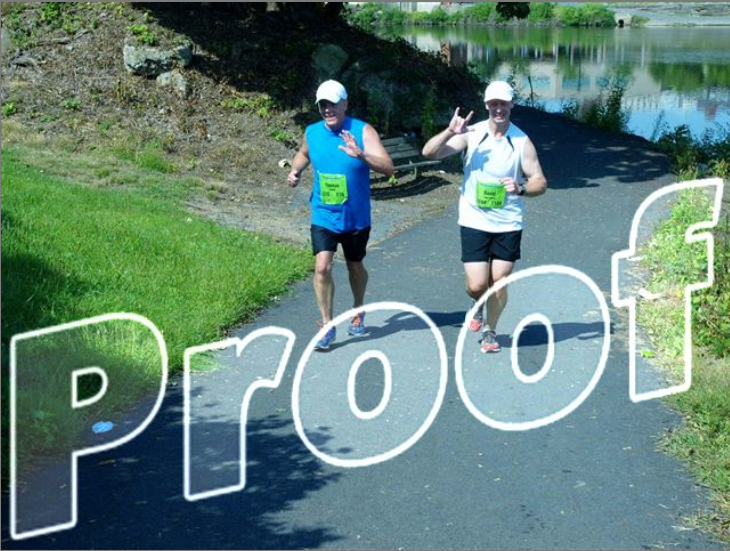 At the point where the finish was a half mile away (uphill), he asked if I was doing okay and I told him I was and to head on as I could see he wanted to run strong at the end. He took off up the hill. As I ran up the hill and onto the final stretch I was feeling much better. The finish was visible and I could hear the announcer on the loud speaker. So I went to my phone app and FaceTimed my brother. He had suggested that a few days earlier, but I didn’t know if I would be in a place to be able to do it or not. So I ran my last .2 miles with my brother and mom cheering me on. I saw the finish in front of me and was running well. Suddenly my right calf cramped. Ugh. Only a couple hundred feet to go and I was limping as I ran. It then worked its way out and I was running again, though a bit more carefully. My running friend of the last two miles finished ahead of me with his two toddlers running with him. How cool. I ran over the finish line only to see TJ there to greet me. 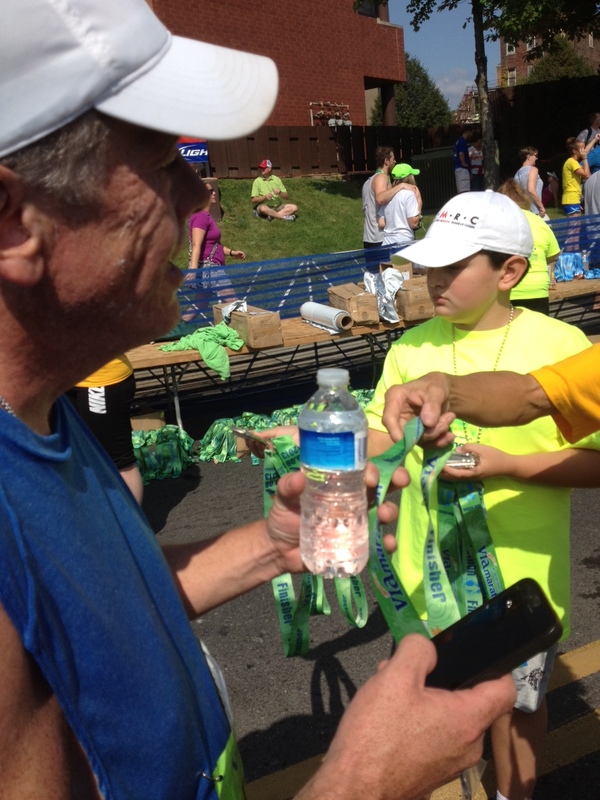 I got my finishers medal and a water. I did it. I finished. 4:14. I then, at TJ’s and my Lovely Wife’s request went to the medic tent for an IV. I was a bit out of it. After about 30 minutes I felt fine and finished with my Intravenous beverage and headed out to catch a shuttle home (a whole other blog post). Tj finished amazingly fast at 3:08 (3 minutes off Boston Qualifying time). I am so proud of him. Special thanks again to my big bro Jeff and my Lovely Wife for posting all the updates. Also special thanks to all of you. The support I have received from the blogging community was way more than I ever expected and had a huge impact in my marathon. When I felt the wall hit and wanted to give up, I would think of YOU. I couldn’t face not finishing and having to post that to this blog. Thank you so much!!! First, thank you to my brother Jeff and my Lovely Wife for posting updates and keeping you all updated on my marathon. Second… Thank you for all your support. This was a rough run, but a good one. I had a great 12 miles and a tough 14.2 miles. I will post a race recap tomorrow , Lord willing. Suffice it to say, I really enjoyed running this marathon. It was my first and I’ll never forget it. I was thinking during the difficult times about the fact that 2 years ago I couldn’t run a 1/4 mile. Well I did, but I had to stop and walk home!!! Now I am a marathoner. Crazy. After a quick stop in the medic tent for an IV, I was back to normal… Sort of. Anyway, you have been wonderful and I can’t thank you enough for your encouragement!!! We did it. We have completed our first maration. Our time was a very respectable 4:15 and in true Geek fashion our hero put his iPhone on FaceTime so his Mother could watch him cross the finish line. Best birthday present a Mother could ever have. Well, It’s been my honor to be able to post these marathon updates on this blog. I’ll be signing off now and like the rest you, I’ll be anxiously waiting to se what comes next in this incredable journey! We’re all very proud of you young man! We’re rounding 3rd and heading for home.